Kayaking appeared in Vietnam in the 1990s, but it only emerged in the last few years when tour operators successfully organized kayak tours and some kayaking clubs of the young who are into adventure are established. If you are planning your trip to Vietnam and want to experience this type, do not miss these destinations below. Located about 25 kilometers from Duong Dong Town, Phu Quoc, Sao beach is one of the most beautiful beaches in Vietnam with white sandy beach and clear water. 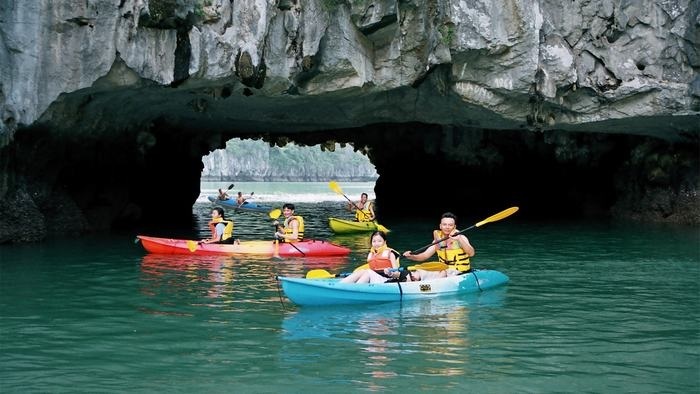 Kayaking is a popular activity for tourists when coming here at the cost of VND 80,000 – VND 100,000 per hour. The boat will take you to the sea where you can feel the pristine beauty of this place. Cua Can River winds through Phu Quoc primary forest. Coming here, you can freely immerse in nature with mountains and water. Because the water is clean, you can even see the fish. The kayak boat goes along Cua Can River, gliding through the storks roosting on bushes, dreamy gardens or peaceful fishing villages heading to the seafront. Thanks to the spectacular scenery, Halong Bay is voted one of the 25 best spots for kayaking in the world. Exploring Halong in this way, you can snake into caves and lake to touch the stalactites and shells, or visit beautiful fishing villages. All will bring you unforgettable memories. The rental service is available at ports, resorts or islands in Halong with the price of VND 100, 000 – VND 200, 000 per hour. There are two interesting routes for adventure lovers to kayak here. The first one is to go on Son River, a tributary of Gianh River in Quang Binh Province. The second option is to explore a part of Phong Nha Cave – the largest cave in the world with a vast underground river system and thousands of stalactites. Just about VND 100,000/ hour, you will get a lot of unique experiences for your trip. Located to the east of Cat Ba Island, just next to Halong Bay, Lan Ha Bay is a peaceful arc with about 400 islands covered with green plants. 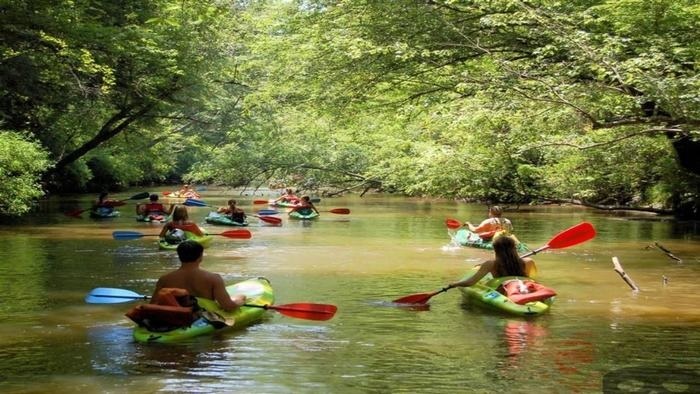 The kayak will take you through the ravines, follow the stone niches to get close to the limestone foothills or explore caves with colorful stalactites and shapes. Also, the clear water under the sun exhibits the vivid scenery of coral reefs with amazing wild beauty. Kayaking on the Han River is a program that Da Nang ‘s kayak club is for those who are new to this subject. This is an opportunity for you to have a completely new feeling about Da Nang City. Starting at the Dragon Bridge, going towards the Han River Bridge and then going back, you will be able to see the whole city on the lights from the middle of the river. The brilliant light that shines over the Han River will make your trip more impressive. Kayaking from the coast of Hoang Sa Road to the South beach of Son Tra Peninsula is an interesting journey. You will admire not only the magnificent scenery with mountains and forests but also the statue of Buddha when passing Linh Ung Pagoda. The clear blue sea and coral reefs will give you a feeling of freedom to explore nature. 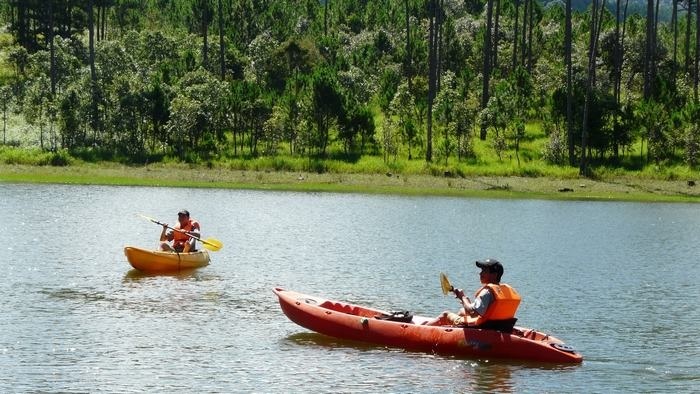 Situated about 5 kilometers south of downtown Da Lat, Tuyen Lam Lake will be a picturesque spot for your kayaking trip. The beautiful pine trees or maple leaves in the lake will make Da Lat more poetic. After seeing the gorgeous scenery at Tuyen Lam Lake, you will go up to explore streams and old forests. Dinh Cape in Ninh Thuan is a convergence of green and beautiful of fantasy. The clean sea here is the ideal condition for you to join the underwater adventure sports such as kayaking at the Tanyoli adventure resort. You will both admire the majestic natural landscape in a new way and train your ingenuity and durability. Discovering Cai River on a small kayak, visitors will enjoy the cool and fresh atmosphere, visit rice fields and Southern villages and learn about the life of people living on the bank of Cai River. You can also move to Thap Ba hot spring center to relax and enjoy romantic songs about the beautiful coastal city. Experiencing kayaking will definitely bring you unforgettable memories for your holiday. We hope that through this post, you can choose the most favorite one for yourself. If you concern more about Phu Quoc Island tour package or need any information, please visit our website. Share this article with others if you find it helpful. Thank you!